Bleecker Street storefront in the Louis Sullivan designed building. Photography by John Gruen. Photo: Todd Merrill. 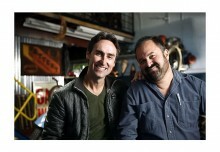 Photography by John Gruen. 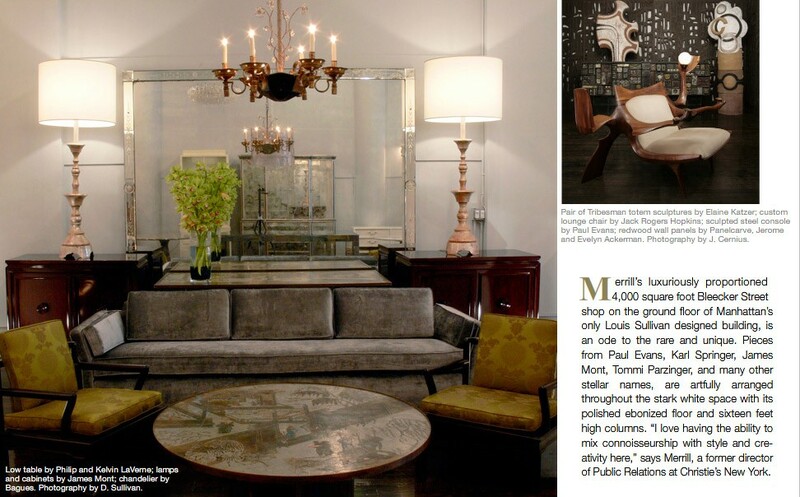 Low table by Philip and Kelvin LaVerne; lamps and cabinets by James Mont; chandelier by Bagues. Photography by D. Sullivan. Pair of Tribesman totem sculptures by Elaine Katzer; custom lounge chair by Jack Rogers Hopkins; sculpted steel console by Paul Evans; redwood wall panels by Panelcarve, Jerome and Evelyn Ackerman. Photography by J. Cernius. Pair of Seniah ledge-back club chairs by Billy Haines, USA, 1959; beveled mirror by Tommi Parzinger, USA, c.1950; console by Tommi Parzinger for Parzinger Originals, USA, c.1950’s; gilded asian figure by James Mont, USA, c.1940s; crystalline resin pagoda by Tony Duquette, USA, c.1965. Photography by D. Sullivan. 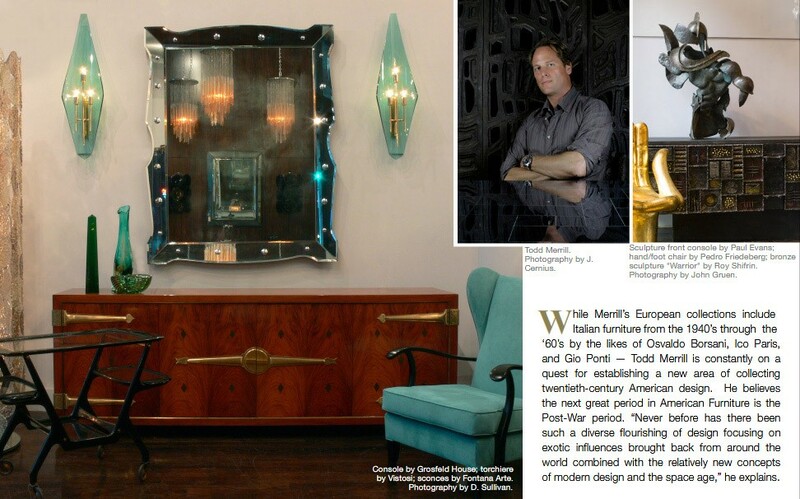 Console by Grosfeld House; torchiere by Vistosi; sconces by Fontana Arte. Photography by D. Sullivan. Todd Merrill. Photographed by J. Cernius. Sculpture front console by Paul Evans; hand/foot chair by Pedro Friedeberg; bronze sculpture “Warrior” by Roy Shifrin. Photography by John Gruen. 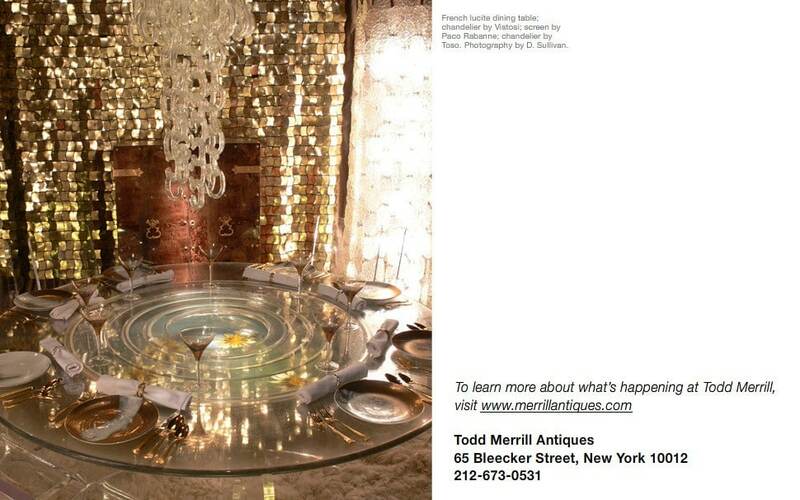 Todd Merrill Antiques storefront, located in the historic Bayard-Condict building on Bleecker Street. Photography by J. Cernius. 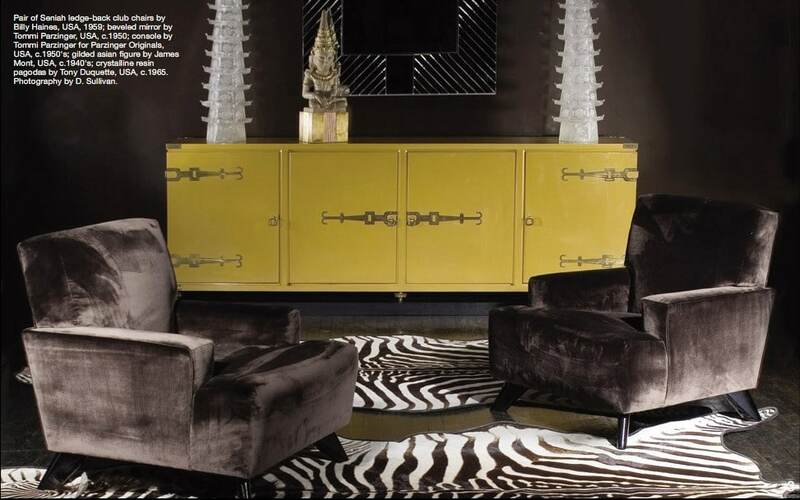 Console by Paul Evans; cantilevered coffee table by Paul Evans; hand chair by Pedro Friedeberg; sconces by Seguso. Photography by D. Sullivan. 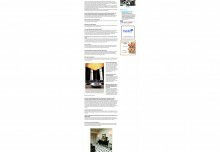 French lucite dining table; chandelier by Vistosi; screen by Paco Rabanne; chandelier by Toso. Photography by D. Sullivan. For Todd Merrill, showcasing the glamorous and the eclectic isn’t just a current passion, it’s part of his personal history, all three generations of it. His grandparents collected American Folk Art back in the 1930’s and his father started Merrill & Company Auctions. And while his family focused their collective talent on American furniture, Merrill’s expert eye travels even further, to include European vintage furniture, antiques, and his renowned collection of massive scale Italian glass lighting, from masters such as Venini, Vistosi, and Murano. Merrill’s luxuriously proportioned 4,000 square foot Bleecker Street shop on the ground floor of Manhattan’s only Louis Sullivan designed building, is an ode to the rare and unique. Pieces from Paul Evans, Karl Springer, James Mont, Tommi Parzinger, and many other stellar names, are artfully arranged throughout the stark white space with its polished ebonized floor and sixteen feet high columns. 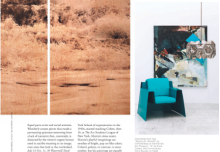 “I love having the ability to mix connoisseurship with style and creativity here,” says Merrill, a former director of Public Relations at Christie’s New York. 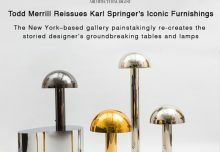 While Merrill’s European collections include Italian furniture from the 1940’s through the ’60s by the likes of Osvaldo Borsani, Ico Paris, and Gio Ponti – Todd Merrill is constantly on a quest for establishing a new area of collecting twentieth-century American design. He believes the bext great period in American Furniture is the Post-War period. “Never before has there been such a diverse flourishing of design focusing on exotic influences brought back from around the world combined with the relatively new concepts of modern design and the space age,” he explains. 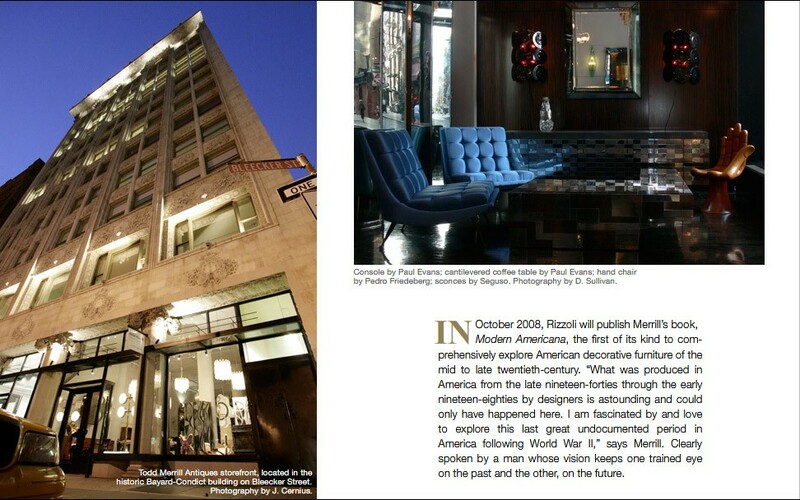 In October 2008, Rizzoli will publish Merrill’s book, Modern Americana, the first of its kind to comprehensively explore American decorative furniture of the mid to late twentieth-century. “What was produced in America from the late nineteen-forties through the early nineteen-eighties by designers is astounding and could only have happened here. I am fascinated by and love to explore this last great undocumented period in America following World War II,” says Merrill. Clearly spoken by a man whose vision keeps one trained eye on the past and the other, on the future.